B1005. (ANDERSON) Anne Tedards. Marian Anderson. New York, Chelsea House, 1988. 111pp. ; Index; Bibliography; Chronology; Photos. - 1-55546-638-9. 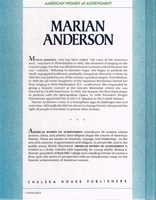 "In 1939, the Daughters of the American Revolution (DAR) refused permission for Anderson to sing to an integrated audience in Constitution Hall. The District of Columbia Board of Education declined a request to use the auditorium of a white public high school. As a result of the ensuing furor, thousands of DAR members, including First Lady Eleanor Roosevelt, resigned. The Roosevelts, with Walter White, then-executive secretary of the NAACP, and Anderson's manager, impresario Sol Hurok, then persuaded Secretary of the Interior Harold L. Ickes to arrange an open air Marian Anderson concert on the steps of the Lincoln Memorial. The concert attracted a crowd of more 75,000 of all colors and was a sensation with a national radio audience of millions. The concert mentioned above was held on Easter Sunday in 1939. Anderson was accompanied by the Finnish accompanist Kosti Vehanen, who introduced Marian to Jean Sibelius in 1933. Sibelius was overwhelmed with Anderson's performance and asked his wife to bring champagne in place of the traditional coffee. At this moment Sibelius started altering and composing songs for Anderson, who was delighted to have met a musician of his magnitude, who felt that she had been able to penetrate the Nordic soul." "Marian Anderson was an African-American contralto and one of the most celebrated singers of the twentieth century. Music critic Alan Blyth said 'Her voice was a rich, vibrant contralto of intrinsic beauty'. Most of her singing career was spent performing in concert and recital in major music venues and with famous orchestras throughout the United States and Europe between 1925 and 1965."